The tectonic plates of the Earth's lithosphere. The lithosphere (from the Greek for "rocky" sphere) is the solid, outermost shell of a rocky planet. In the case of the Earth, the lithosphere includes the crust and the upper layer of the mantle that is joined to the crust. The lithosphere contains a rich variety of minerals. In addition, it continually interacts with the atmosphere and hydrosphere. The Earth's lithosphere provides us with the "terra firma" on which we live. To sustain our lives, we need access to air, water, soil, and sunlight, and we need the ecosystems created by plants and animals. The lithosphere gives us access to all of these simultaneously. While dwelling on the lithosphere, we are surrounded by air, receive the Sun's heat and light, and have access to freshwater and various minerals that we use for our domestic, agricultural, and industrial activities. In forming the lithosphere, the Earth's crust and upper mantle are attached to each other, but they differ in chemical composition. The boundary that marks this change in chemical composition is known as the Mohorovičić discontinuity (or the Moho discontinuity). Thus the distinguishing characteristic of the lithosphere is not its composition but its flow properties. It floats on the asthenosphere, which is the heat-softened layer of the mantle below the lithosphere. The lithosphere is fragmented into relatively strong pieces called tectonic plates, which move independently relative to one another. 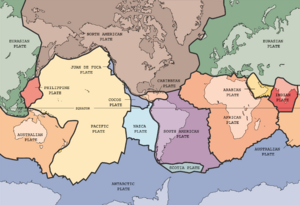 This movement of lithospheric plates over the asthenosphere is described as plate tectonics. There are two types of lithosphere: the oceanic lithosphere, or oceanic crust, and the continental lithosphere, or continental crust. The oceanic crust is the part of Earth's lithosphere that surfaces in the ocean basins. The continental crust is the layer of rocks that form the continents and areas of shallow seabed close to their shores, known as continental shelves. The two types of crust differ in composition, density, and thickness. As a whole, the oceanic crust is thinner but denser than the continental crust. The oceanic crust is generally less than 10 kilometers (km) thick, and its mean density is about 3.3 grams per cubic centimeter (g/cm3). The thickness of the continental crust ranges from 20 to 80 km, and its density is less than 3 g/cm3. As a consequence of the density difference, when active margins of continental crust meet oceanic crust in regions known as subduction zones, the oceanic crust typically sinks beneath the continental crust and is recycled back into the mantle. At the same time, new oceanic crust is continually being produced at mid-ocean ridges from mantle material. In addition, as the oceanic lithosphere grows older, it gets cooler and denser, with the result that if two oceanic plates converge, the older one will subduct below the younger one. As a consequence of these processes, most of the present-day oceanic crust is less than 200 million years old. By contrast, the continental crust is rarely subducted or recycled back into the mantle. For this reason, the oldest rocks on Earth are within the stable "cratons" of the continents, rather than in repeatedly recycled oceanic crust. (A craton is a stable part of the continental crust that has survived continental merging and splitting for 500 million years or more.) The oldest continental rock is the Acasta Gneiss, with an estimated age of 4.01 billion (4.01x109) years. The oceanic crust is composed mainly of mafic rocks. The term mafic is applied to silicate minerals and rocks that have high concentrations of relatively heavy elements, particularly magnesium and iron. The word "mafic" is derived by combining letters from magnesium and ferrum, the Latin word for iron . Mafic minerals are usually dark in color. Common rock-forming mafic minerals include olivine, pyroxene, amphibole, biotite and other micas, augite and calcium-rich plagioclase feldspars. Common mafic rocks include basalt and gabbro. The continental crust consists predominantly of felsic rocks. The term felsic is used in referring to silicate minerals, magmas, and rocks that are enriched in silica and light elements such as oxygen, aluminium, sodium, and potassium. The word "felsic" combines letters from the words feldspar and silica. Felsic minerals are usually light in color. Common felsic minerals include quartz, biotite, muscovite, hornblende, orthoclase, and sodium-rich plagioclase feldspars. The most common felsic rock is granite. It is a matter of debate whether the amount of continental crust has been increasing, decreasing, or remaining constant over geological time. One model suggests that prior to 3.7 billion years ago, the continental crust constituted less than 10 percent of the present amount. By 3.0 billion years ago, that figure rose to about 25 percent, and by about 2.6 billion years ago, it was about 60 percent of the current amount (Taylor and McLennan 1995). The growth of continental crust is thought to have occurred in "spurts" of activity, corresponding to five episodes of increased production through geologic time (see graphic at Butler). Saal, A.L., Rudnick R.L., Ravizza G.E. & Hart S.R. 1998. Re-Os isotope evidence for the composition, formation and age of the lower crust. Nature 39317, 1998.
von Huene, R. and D.W. Scholl, 1991. "Observations at convergent margins concerning sediment subduction, subduction erosion, and the growth of continental crust." Reviews of Geophysics 29: 279-316. This page was last modified on 24 July 2018, at 13:23.